If you are interested in cannibalism, or biology in general, you should listen to this Cannibalism Talk by evolutionary psychologist Diana Fleischman. I didn’t realize just how many sub-types of cannibalism there were before I listened to this. She doesn’t just cover human cannibalism, she also discusses cannibalism in many other species, and explains why this behavior evolved. Some species will even eat their own offspring! After all, as she often says, the flesh of your own species is the best possible multi-vitamin. Some of what she says made me feel nauseous, while other parts were funny. For those of you who don’t already know, Fleishman isn’t just a scientist, she’s a vegan. I think this gives her some deep insights into cannibalism that non-vegan biologists may have trouble understanding. I highly recommend listening to this talk and reading some of the well-researched articles on her Sentientist blog. All of them are gems. Her blog is one of the best science-based vegan blogs out there. I sometimes say that anyone can learn to joggle. While this may not be entirely accurate, what I’m really trying to say is that it is not as difficult or as incredible as it looks. What people see is the result of a ton of training. It has taken me many years to get the point where I am at now. I have joggled for thousands of miles, and just recently joggled my first 1,000 miles for the year. What level am I at now? 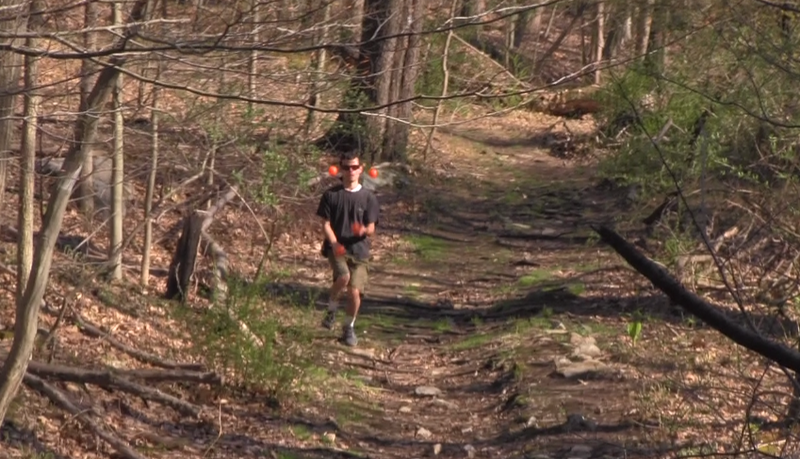 Last week, I did a 20 mile joggling run while it was in the mid 80s and humid. Several of those miles were on rocky, hilly, curvy forest trails. Surprisingly, I didn’t drop the balls even once, though I had to take 2 short breaks to cool off and drink some Gatorade. I even did a lot of tricks, especially in the first half. I was actually expecting to drop because of the heat, and how much I was sweating, and because of the rockiness of the trails. But it looks like my muscle memory didn’t fail me even in these extreme conditions. This isn’t the first time I’ve run 20 miles without dropping, but it was the first in mid 80s weather. I also did a 12 mile run last week, much of which involved joggling up the steepest hills ever(for me), and didn’t drop during the entire run. I was shocked, to be honest. As much as I know this is the result of training, I can’t help but wonder if my genes give me an edge somehow. Alright, that sounds ridiculous even to me and those who know me best. I don’t come from a long line of gifted athletes, nor have I ever displayed any athletic ability before I took up joggling. Nor have I ever been a good dancer, which is similar to juggling and joggling. The association between AVPR1a and SLC6A4 polymorphisms and creative dancing does not exclude the presence of the same polymorphisms in nondancing groups of subjects. Almost all of us dance and almost all of us have engaged in sports. What the current study suggests is that the combination of polymorphic variants contributing to creative dancing is overrepresented in the dancers. There is no reason to suggest that the nondancer athletes or the control group of nondancers/nonathletes are devoid of these polymorphisms, but the current study provides evidence that these variants are relatively scarce in other groups not specifically selected for the creative dancing phenotype. Importantly, we not only compared creative dancers to performing athletes but also validated the case-control design using a family-based study that avoids the conundrum of a comparison control group that might be “contaminated” with polymorphisms contributing to creative dancing. As for most complex traits, the effect size of these two genes is small and in Risch’s terminology will have small displacement. These “dance” genes may play a role in coordination, but also show links with spirituality, and artistic creativity. They also seem to be linked with serotonin and brain anatomy. Serotonin plays an important role in the central nervous system. It affects mood and behavior, and many mind-altering drugs strongly influence our serotonin pathways. It is difficult to disentangle what is really going on here, since genetics is very complicated and I lack expertise in it. I often claim that joggling is just like dancing, so it is possible these “dance” genes may influence a person’s joggling ability, though this is speculation on my part. Obviously, no matter how much a person trains, not everyone can reach the same level of joggling ability, just as not everyone can reach the same level of dance ability or martial arts ability. I do wonder sometimes if all the people I know who can’t even learn how to juggle may be genetically disadvantaged somehow. However, none of this means that if you are trying to learn to joggle you should give up if you aren’t a good dancer or lack coordination. Keep in mind my background as a lousy dancer and even worse athlete, and how I started juggling and joggling while recovering from a car accident. The brain is very plastic; even if you lack these genes(assuming they give an edge to pursuits requiring coordination), it may still be possible to become a skilled joggler with enough practice. Now that the weather is getting warmer, the birds are coming out to play, to sing, and to search for food. Lower Westchester county in New York has numerous wild bird species, each with its own unique bird call, and unique resplendent plumage. Like I sometimes say to visiting friends, if you want to see a fantastic fashion show in New York, you can’t beat going bird-watching. Now I am not very good at recognizing bird species, either by their call or by sight, but I believe the above is a robin. I could be wrong though. If it is a robin, it is most likely an American Robin or Turdus migratorius, which is a species of the Thrush family. If it isn’t an American Robin, it must be another type of Thrush. This is one of the most common bird species in North America, and according to Wikipedia there are 7 sub-species of American Robin. If you want to take a stab at guessing the sub-species of the bird above, be my guest. The noisy bird in the above photo is a member of the Woodpecker or Picidae family, or near passerine birds. This woodpecker sure made a lot of noise pecking into the trunk of that tree to search for insects. This was how I became alerted to its presence. I rarely see them. I’m guessing that it is a Hairy Woodpecker or Picoides villosus, based on its black and white plumage and size. They live throughout North America, but particularly in deciduous forests. It’s always wonderful seeing and hearing all these unique species while running or walking. 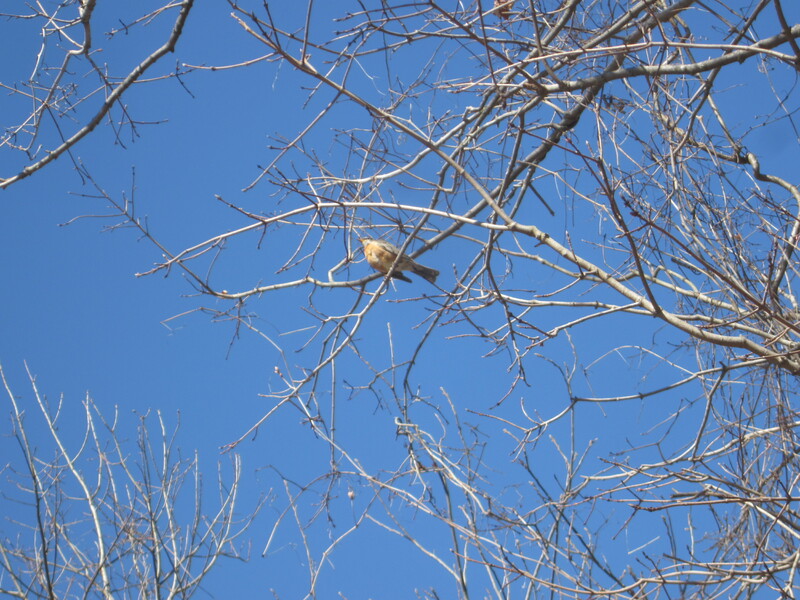 Besides woodpeckers and robins, I also often see cardinals, hawks, and some other species I have trouble identifying. The unidentifiable species add a bit of mystery to the local forests, as I try to figure out at least which bird family they belong to. They are difficult to photograph. I hope all you northern hemisphereans are enjoying the spring, and if you’re a southern hemispherean, autumn! What is the Finno-Ugrian Suicide Hypothesis? Multiple lines of evidence indicate specific genetic contributions to suicidal behavior. In particular, geographic studies support the Finno-Ugrian Suicide Hypothesis, i.e., genetic differences between populations may partially account for geographic patterns of suicide prevalence. Specifically, within Europe the high suicide-rate nations constitute a contiguous J-shaped belt. The present research replicated and extended 2003 findings of Voracek, Fisher, and Marusic with new data. Across 37 European nations, an interaction term of squared latitude multiplied with longitude (quantifying the J-shaped belt) accounted for 32% of the cross-national variance in total suicide rates alone, while latitude accounted merely for 18% of variance over and above those. Refined analysis included regional data from countries critical for testing the hypothesis (89 regions of Belarus, western Russia, and the Ukraine) and yielded an even more clear-cut pattern (56% and 3.5%, respectively). These results are consistent with the Finno-Ugrian Suicide Hypothesis. Study limitations and directions for further research are discussed. Some of you may be wondering who the mysterious Finno-Ugrians even are. 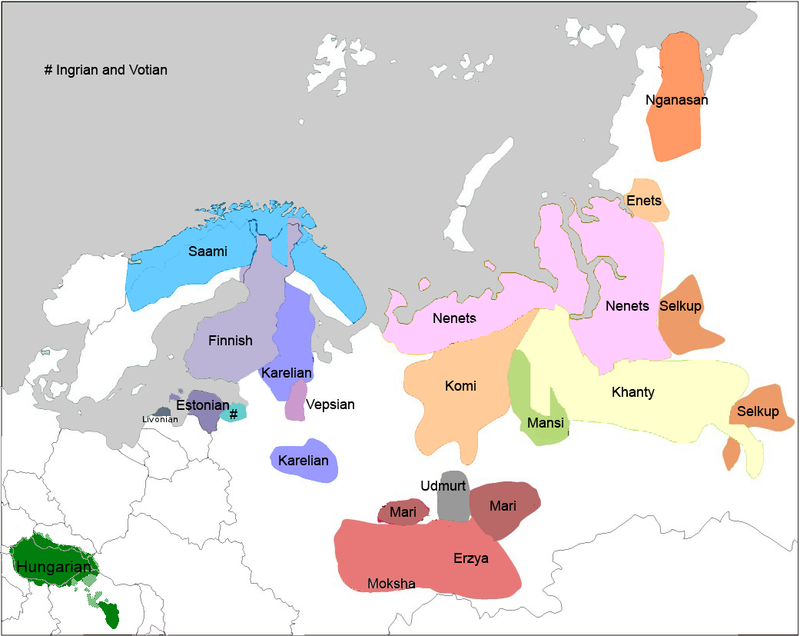 They are simply a diverse ethno-linguistic group that is native to eastern Europe, Scandinavia, and Russia. The most well known are the Finns and Hungarians. In the map above, you can see their lesser known linguistic cousins scattered across much of Russia and northern Scandinavia. The thing that is most remarkable about these peoples, besides the genetic isolation of some of the northern groups, is that they are among the few native Europeans whose mother tongue is not an Indo-European language. Almost everyone else with a long history in Europe is a speaker of an Indo-European language, like Italian, Russian, German, Greek, Spanish, and even English(some genes are said to be associated with the early spread of Indo-European languages, but that is beyond the scope of this post). No, it’s not because they are an extreme ethno-linguistic minority that Finno-Ugrians have a higher suicide rate. The Finno-Ugrian Suicide Hypothesis suggests that genes that are unique to or occur more frequently among Finno-Ugrians predisposes them to suicide. For a long time, many researchers just assumed that the extreme northern environment many Finno-Ugrians live in, and social factors were the primary cause of their higher than average suicide rate. However, when researchers controlled for the environmental and social factors(comparing them to non-Finno-Ugrians living in the same environment), it became apparent that something genetic was making a significant contribution to their higher suicide rate. Of course, this is something that shows up in aggregate, and doesn’t render environmental or social factors meaningless for individuals. While these genes tend to be mostly unique to speakers of Finno-Ugrian languages, some Russians and other Indo-Europeans in eastern Europe carry these genes. Russians also have a high suicide rate. This may be due to the Russians slowly assimilating many Finno-Ugrians over the centuries into the larger Russian ethnic group, as Russia expanded across northern Eurasia and Russified many different native ethnic groups. In other words, this means there are people who are Finno-Ugrian by blood who speak Russian or other non-Finno-Ugrian languages as their first and only language. In part, I am fascinated by this because Linus Torvalds, the influential software engineer who created the kernel of the Linux/Android operating system I use is Finnish, besides, of course, my interest in genes and mental health. And Finland has also produced some amazing runners. They haven’t been able to find any Finno-Ugrian running genes though. Why Finno-Ugrians have these “suicide” genes is a mystery(it is possible they have some advantage), but please don’t panic if you are Finno-Ugrian or know someone who is. Of course, we can’t change our genes(not yet), but hopefully, science will find better ways of treating mental disorders that lead many to suicide. Generally speaking, I do not believe that scientists should debate creationists. It makes creationism look more legitimate than it really is, when in reality there is nothing to debate. Creationism is not science, it is not an “alternative” scientific theory. The way I see it, it is no different from a geologist debating a flat-earther. Now Bill Nye isn’t a scientist, he’s a mechanical engineer, and an entertainer/science popularizer(he was on “Dancing with the Stars” not too long ago). So I suppose this is kind of different than if a prominent biologist were to debate Ken Ham. Personally, I believe only comedians who understand a thing or two about evolution should debate creationists – one clown versus another clown. It’s just a waste of time for scientists. This is kind of like asking “If most Americans are descended from Europeans, why are there still Europeans?” Even if this was true, and we are the descendants of a currently existing species of monkey, this doesn’t refute evolution. This question also presupposes the erroneous idea that humans are somehow more “evolved” than monkeys, and that the less “evolved” species should go extinct. Monkeys are just as evolved as we are, they just evolved in a different environment. The truth of the matter is that we are not descended from any currently existing ape or monkey species, though we all share a common ancestor from tens of millions of years ago. But now, this is where it gets a little tricky. Our now extinct primate ancestors from millions of years ago would almost certainly qualify as “monkeys” if they were alive today. Take a look at the tree-dwelling Archicebus achilles, said to be one of the earliest primates and an ancestor of humans, apes, and monkeys. Scientific classifications are now more often based on monophyletic groups, that is groups consisting of all the descendants of a common ancestor. 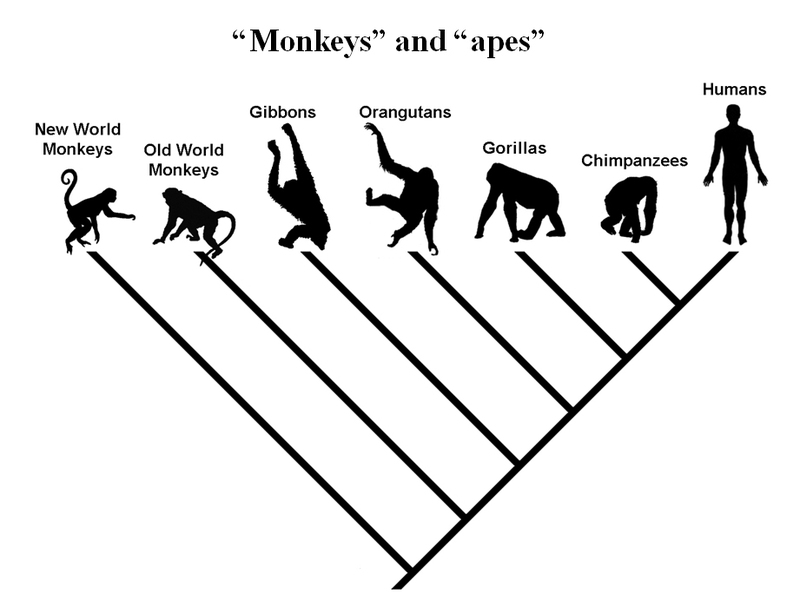 The New World monkeys and the Old World monkeys are each monophyletic groups, but their combination is not, since it excludes hominoids (apes and humans). 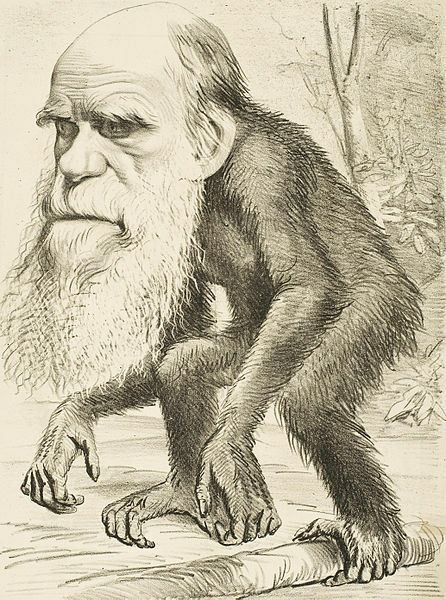 Thus the term “monkey” no longer refers to a recognized scientific taxon. The smallest accepted taxon which contains all the monkeys is the infraorder Simiiformes, or simians. However this also contains the hominoids (apes and humans), so that monkeys are, in terms of currently recognized taxa, non-hominoid simians. Believe it or not, I covered the rather confusing concept of “monophyletic” in my “I do not eat dinoaurs” post. I occasionally have to relearn what it means, so don’t worry if it confuses you! So if someone wants to say that we are descended from monkeys, that isn’t entirely unscientific if they mean a long extinct species of archaic monkey or “proto-monkey”, not a currently existing monkey species. I realize this may be confusing. Even if we had a complete tree of life for all currently existing and extinct primate species, pinpointing which species was the first “monkey”, or which species qualify as “monkeys” and which do not, would be pretty much impossible, due to the various conflicting ways of defining what a “monkey” is. Science, especially biology, often deals with fuzzy sets and as a result, there are all these fun semantic disputes among scientists. Novella’s answer to this question is kind of different from mine, mostly because he wants his answers to be succinct and to the point, but I still agree with him. I may not be as much of an expert as Novella, so if I got something wrong, don’t hesitate to correct me. For more info: Are We Descended From Monkeys? The current state of science literacy in the U.S is an embarrassment. Widespread rejection of evolution is but one major symptom of this. I applaud Bill Nye for doing what he can to try to remedy this situation, but debating creationists may not be the best way to do it. Tagged are humans descended from monkeys, Bill Nye, Bill Nye evolution debate, creation museum, creationism, creationism is not science, evolution questions, evolution versus creationism, flat earth theory, humans and monkeys share a common ancestry, humans are descended from monkeys, intelligent design, Ken Ham, questions about evolution, scientific literacy, should geologists debate flat earthers?